Henriette Suhr, widely remembered as a retailer and the interior designer who created Bloomingdale’s imaginative furniture showrooms, is the owner of Rocky Hills, a renowned thirteen-acre hillside garden in Westchester County. 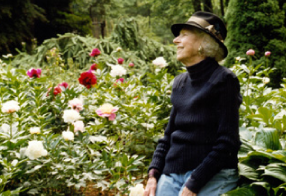 With her late husband, William Suhr, an esteemed art conservator, she turned her artistic talent in the direction of gardening and horticulture fifty years ago, after the purchase of Rocky Hills as their week-end home. On the picturesque, hilly site, Henriette and ‘Billy’ Suhr planted tens of thousands of bulbs, numerous rare trees, and an unrivaled collection of azaleas and rhododendrons. Mrs. Suhr now lives at Rocky Hills year-round and continues her gardening activities on a daily basis. With the help the Garden Conservancy, Friends of Rocky Hills, and the Westchester County Department of Parks, Recreation and Conservation, she is taking steps to ensure that this landscape masterpiece will become a horticulture education center and a place that will delight garden enthusiasts for years to come.